James Ensor was one of the most original painters of the late nineteenth century. Populated with masks and skeletons, his macabre images are morbid commentaries on the human condition, his hometown of Ostend on the North Sea, Belgian history, and his own mortality. Human bones were regularly uncovered in Ostend well into the twentieth century, residue of the carnage there during early seventeenth-century warfare, and Ensor retained childhood memories of their exhumation. In 1888 he made a little etching of himself as a reclining skeleton in slippers, entitled My Portrait in 1960 (that is, at age one hundred). Belonging to a group of closely related paintings from the late 1880s, the enigmatic Skeletons Warming Themselves is among the artist’s masterpieces. 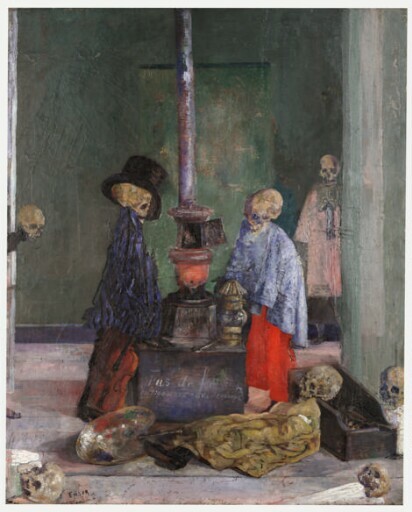 He has placed three dressed-up skeletons in the foreground around a stove on which is written “Pas de feu” and under it “en trouverez vous demain?”—“No fire. Will you find any tomorrow?” The skeletons are accompanied by a palette and brush, a violin, and a lamp. Presumably Ensor intended these items to symbolize art, music, and literature. If so, the probable implication is that artistic inspiration, or patronage to support it, has expired. Understood as a scene in an artist’s studio, Skeletons Warming Themselves resembles a vignette from the popular medieval and early Renaissance print cycles of the Dance of Death, each print portraying skeletons as an allegorical comment on the vanities of a particular profession or social type. X-radiographs reveal another finished picture beneath this scene. It is a bust-length portrait of a young girl, probably painted before 1883. Ensor’s reuse of an earlier canvas may reflect his own difficult economic condition in 1889.